Despite having over 130 million mobile phone subscribers, Pakistan still has the lowest percentage of smartphone owners and internet users amongst 24 emerging and developing nations surveyed by the Pew Research Center. Amongst the 24 nations surveyed, Pakistan has the lowest percentage of people who own a cell phone with only 53% saying that they have a cell phone. 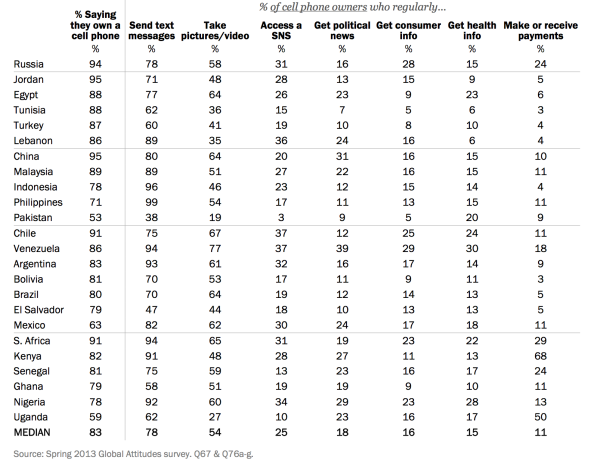 This is a rather surprising figure as cellular teledensity in Pakistan is well over 70%. Out of the 53% users who own a cell phone only 38% use it to send text messages, while only 3% access Social Networking Sites (SNS). 19% mobile owners in Pakistan use their phones to make videos or to take pictures. In all 24 nations the percentage of people who own a mobile phone is above 50%; with China and Jordan at 95%, Russia at 94% and South Africa and Chile boasting a 91% mobile ownership in their respective countries. The chart below shows the percentage of mobile ownership in the surveyed countries and various other activities that mobile owners carry out on their devices. The countries are segmented according to their geographical location. Despite the availability of affordable smartphones in the Pakistani market, we have the lowest smartphone ownership percentage at merely 3%. This figure can be of great concern for cellular operators, especially with the planned auction of the 3G and 4G licenses due in a few months time. However, at the same time, this shows the potential Pakistani market bears for the broadband and cellular industry. Pakistan and Uganda were removed from various other results generated by the Pew Research Center report. The highest percentages of internet users are in Russia, Chile, and Argentina; all three nations cross the 65% user mark. The chart below gives a more detailed look on the internet usage in these countries in given below. The survey also links internet usage with income. According to the research, a country with higher GDP per capita has a higher percentage of internet users. The countries with highest per capita incomes in this survey are Chile, Argentina and Russia; these nations also have the highest internet usage rates. In countries with low GDP, such as Pakistan and Uganda, nine-in-ten people never go online. Things are changing fast its more than year or two people have started shifting on smart phones and in couple of years this percentage will be far better. Everyone who purchases new phone mostly goes for smart phone. There are poeple who use their phones for just texting and calling they won’t, they don’t have to. Plus for anyone who have to call all day or receive em, the phone with buttons is best considering battery life etc. We haven’t electricity in our country. We can not recharge our cell phone batteries. We have not evo service in KPK and how we can see toward smart phones and why we should use these phones. The criterion describes in this report is based on usage. However, this must have been based on how many smartphones sold last quarter/year.